Homemade versus store bought baby food: Your kitchen beats the jars. Sorry, busy parents, but it’s true. Puree that baby food yourself. She’ll thank you for it. Before my son was even born, I owned two baby-food cookbooks and dozens of plastic baby-food jars (BPA-free, of course). I have always loved to cook, so it was no surprise to anyone that I would be chef to my infant, too. There were certainly exceptions—I tried to serve my son commercial rice cereal a few times (“tried” being the operative word; he was not a fan! )—but most of what he put into his mouth during the first year of his life came either from my body or from my kitchen. Most commercial baby foods are fine—but homemade baby foods, when prepared properly, can have a nutritional and economical edge. 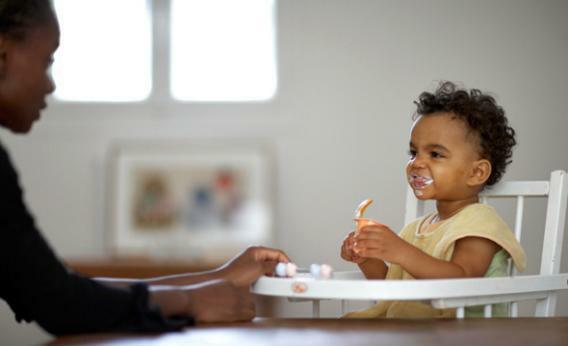 Compared to equal amounts of home-prepared fruits and vegetables, commercial baby foods tend to have more sugar, more sodium, and less fiber, and they’re much more expensive. But, you say, I pay for homemade baby food with my time. That’s true—yet many preparations are simple and easy, and you can also serve babies some of the same foods you prepare for yourself. I will never, ever understand why parents buy banana purées when all you have to do is pick up a fork and mash up a banana. A single serving of the former costs more than 50 cents at my local grocery store, whereas an equivalent amount of the latter comes out to 11 cents. Actually, let’s stay with this banana example a little longer, because it will help me illustrate the nutritional differences between homemade and store-bought baby foods. Each 71 gram serving of Gerber 1st Foods Banana Purée contains 13 grams of sugar, 5 milligrams of sodium and less than 1 gram of fiber. But 71 grams of mashed-up banana contains only 8.7 grams of sugar (a teaspoon less), under 1 milligram of sodium, and 1.8 grams of fiber. And lest you think it’s just a brand problem, a 71 gram serving of Earth’s Best 1st Bananas —you know, the brand that’s supposed to be more virtuous than Gerber—contains 12 grams of sugar, 1 gram of fiber, and even more sodium (20 milligrams). What about those nitrate warnings? Nitrates are chemicals that naturally occur in vegetables such as green beans, carrots, squash, spinach, and beets, and exposure to high levels can cause a dangerous blood disorder in infants. The American Academy of Pediatrics’ consumer website says that commercial baby foods are “safer” than homemade ones in part because companies monitor the nitrate levels of the vegetables they use, but the organization clarifies in a related policy statement that nitrates from vegetables prepared at home only pose risks to infants younger than 3 months. Uh—nobody should be feeding solid foods to babies younger than 3 months. In fact, the AAP just announced that parents should wait to introduce solid foods until infants are at least 6 months old. So, nitrates in homemade baby food shouldn’t be a concern. The other issue worth mentioning is arsenic. Last year, Consumer Reports found that commercial infant rice cereal is laced with the naturally-occurring metal, which has been shown to cause chronic health problems including cancer. The U.S. Food and Drug Administration followed up with its own analysis, basically confirming the findings. The obvious question: Are babies being exposed to enough arsenic from rice cereal to pose problems? Are there benefits to commercially prepared baby foods? Gerber formulates its foods in a way that ensures that they are free of disease-causing microorganisms. So the next time fruit is implicated in a salmonella outbreak, you can rest assured that your store-bought jars are safe. Gerber spokesperson Elizabeth Velez also made the case to me that commercial baby foods are provided in “developmentally appropriate” textures, which parents may not be able to achieve at home. But Stasenko counters that the ability to individualize textures can actually be an upside of homemade baby foods: “If parents follow rigidly the sequence of textures or ‘stages’ as they are set by food manufacturers, they may become less attuned to their babies’ needs and abilities,” she says. Gerber also fortifies its baby foods with vitamin C, which Velez says is important because “the majority of fresh fruits appropriate for babies are not significant sources of vitamin C.” That last part may be true, but infants only need 40 to 50 milligrams of vitamin C a day, and according to the National Institutes of Health, babies usually get plenty from breast milk or formula. It’s probably no coincidence that the vitamin Gerber chose also happens to be a powerful food preservative. If the company wanted to fortify with something babies really need, it might opt for vitamin D.
So what’s the best food strategy for exhausted, busy parents? If you can’t prepare anything at home, don’t beat yourself up—go with the commercial jars or pouches, but compare nutrition labels and choose products that are low in sugar and sodium and high in fiber (bonus if they’re organic—yes, that includes Earth’s Best—because for infants, it’s best to minimize exposure to pesticides). But home preparations really aren’t that difficult, and they are so much cheaper. You can make food in big batches on the weekends and freeze single servings in small containers that you defrost during the week. (There are lots of great websites and books for inspiration.) If you like to cook, you can also feed babies the same food that you serve everyone else. “If the family is having a roasted chicken with mashed potatoes and green beans for dinner, each of these meal components can be adjusted texture-wise to make it appropriate for a baby,” Stasenko says (but you should set baby’s portion aside before adding salt and other spices).